Vox Telecom of South Africa will offer low-cost satellite broadband nationwide late next year, in partnership with Dubai-based Al Yah Satellite Communications Company (Yahsat). China successfully launches Zhongxing-20A communications satellite on Long March 3A rocket. Ariane 5 ECA launches with HYLAS 1 and Intelsat 17. Astrotech Wins Sixth NPOESS Contract for $35 Million. Otesat-Maritel of Greece becomes a Distribution Partner for Inmarsat’s Global Satellite Phone Services (GSPS) IsatPhone, the first satellite handheld by Inmarsat with global coverage. Russian Business Communications Provider Leases NSS-9 Capacity from SES. XM Canada and Sirius Canada Inc. merging; pushing for service in more vehicles and on more devices like smartphones and personal computers to better compete in audio entertainment industry. China launches Shen Tong-1 military satellite via Long March-3A. Russian Communications Administration to represent interests of Azerbaijan in the International Telecommunications Union. FCC codifies legislation passed in spring of 2010 allowing DBS operators to provide out-of-market broadcast signals to households unable to receive in-market broadcasts over the air. The U.S. Department of Defense’s STPSat-2 satellite has launched from the Kodiak Launch Complex, Alaska on board a Minotaur 4 rocket. TerreStar Networks, in the midst of chapter 11 bankruptcy proceedings, launches new satellite phone called TerreStar GENUS, billed as the first combined cellular-satellite smartphone. USA launches the biggest-ever spy satellite, to be used "to listen to the communications of potential enemies." XipLink optimizes satellite Internet delivery with three technologies – transport layer TCP Acceleration and optimization, HTTP Acceleration, and advanced data compression. Energia, Russia’s Rocket and Space Corporation, says the Company will build a special orbital pod designed for sweeping-up satellite debris from near-Earth space. KVH and Viasat double satellite capacity in North Atlantic for Mini VSAT maritime broadband service. NASA’s Organism/Organic Exposure to orbital Stresses nanosatellite is successfully launched from Alaska Aerospace Corporation’s Kodiak Launch Complex. SpaceX gets first ever FAA license for commercial company to re-enter a spacecraft from orbit. Hughes Network Systems and Environmental Safety Systems International Corporation are equipping entire Hercules Offshore fleet of Class 120 to Class 230 liftboats in the Gulf of Mexico with Hughes satellite-based broadband maritime services. Global Marine Networks debuts GMN webXaccelerator for ship-to-shore and remote communications needs fishing, marine transport, cruise ships, offshore oil rigs, and first-response communications. United Launch Alliance (ULA) racked up its fourth successful flight of a Delta IV Heavy, which blasted off Nov. 21 from Cape Canaveral Air Force Station, Fla., carrying a classified satellite for the U.S. National Reconnaissance Office. The launch occurred at 5:58 p.m. EST. ULA halted commentary about seven minutes after liftoff. 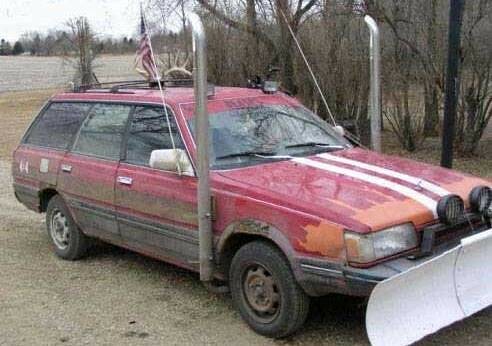 At the time, the vehicle was performing as expected. The launch had been delayed from Nov. 18 to replace ground support equipment pyrotechnic ordnance lines, and on Nov. 19 due to anomalous temperature data signatures in the common core strap-on boosters. The problem was traced to faulty temperature sensors, which were replaced. 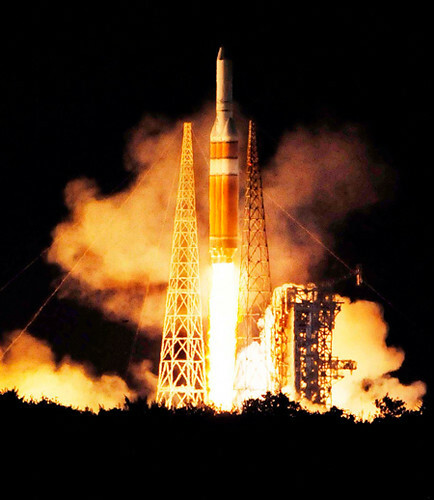 The Delta IV Heavy, currently the nation’s most powerful unmanned rocket, debuted on a demonstration flight six years ago, then flew two operational missions in November 2007 and January 2009. The rocket, which was built by ULA in Decatur, Ala., is comprised of a common booster core with two strap-on common booster cores. Each is powered by an RS-68 cryogenic engine and an RL10B-2 cryogenic engine powers the second stage. Pratt & Whitney Rocketdyne builds both engines. The payload was encased by a 5-meter diameter aluminum, tri-sector payload fairing. The launch was the eighth and final flight this year for ULA. The company’s next launch is with another Delta IV Heavy for the NRO, scheduled for Jan. 11, 2011, from Space Launch Complex 6 at Vandenberg AFB, Calif.
There’s no question certain wireless markets are operating at peak capacity. U.S. operators such as AT&T simply can’t expand their bandwidth fast enough. This is especially true in New York and San Francisco. Verizon Wireless is hooking up their towers with 10 GB fiber connections. So what’s the solution after Verizon gets the iPhone on their network? LTE, no doubt. The ILS Proton Breeze M launched from Pad 39 at the cosmodrome at 11:29 p.m. today local time (12:29 p.m. EST, 17:29 GMT) After a 9 hour 14 minute mission, the Breeze M successfully released the SkyTerra 1 satellite, weighing over 5.3 metric tons, into geostationary transfer orbit. This was the 361st launch for Proton since its inaugural flight in 1965, and the 63nd ILS Proton launch overall. The Proton Breeze M launch vehicle was developed and built by Khrunichev Research and Production Space Center of Moscow, one of the pillars of the Russian space industry and the majority shareholder in ILS. The SkyTerra 1 satellite, to be located at 101.3 degrees West, was built on the Boeing 702HP platform designed for geomobile services with an estimated lifetime of fifteen years. The SkyTerra 1 satellite features a 22-meter L-band reflector-based antenna — the largest commercial antenna reflector to be put into service. SkyTerra 1 will be among the first to combine satellite and terrestrial technologies for use in standard handsets and other devices. The 4G-LTE network offered by SkyTerra 1 will also be the first to provide wireless coverage to 100% of the population of the United States. LightSquared’s mission for SkyTerra-1 is to act as an ATC — Ancillary Terrestrial Component. This may be the only way to make satcom pay for providing service to handhelds. Stay tuned, rocket scientists. MEASAT signs agreement with GlobeCast for provision of capacity in supporting delivery of Asian Games. Partners In Health (PIH) selects SES WORLD SKIES AMC-6 satellite to expand and enhance mission critical connectivity across Haiti. U.K. satellite ISP Bentley Walker launches C-band satellite internet services for customers in Africa, Europe, and the Middle East. Surrey Satellite Technology Ltd (SSTL) repositions UK-DMC-1 spacecraft, nearing end of operational life, to reduce probability of generating space debris. Globecomm Systems wins African wireless managed services contract. Pactel International appointed to assist MEDINET Project in Vanuatu by providing internect connectivity to medical facilities in remote regions of country. SatLink Communications launches iDirect Evolution to enhance its data services across Europe, the Middle East, Africa, and Asia. Orbital Sciences successfully test fires liquid fuel AJ26 engine that will power first stage of Taurus II space launch vehicle. Raytheon secures over $2B in U.S. government space and military contracts in October. SES WORLD SKIES signs NSS-5 capacity agreement with Vizada Networks for telecommunications network backup across Africa’s Sub Saharan region. U.S. Department of Defense awards contracts to Iridium for upgrading satellite communications gateway in Hawaii to support migration to next generation satellites. Satellite communications company SatCom Group Holdings Plc acquires Abbey Technologies GmbH of Switzerland. Riverbed Technology acquires government satellite network optimization specialist Global Protocols. ND Satcom is awarded "Citrix Ready Partner" status at Citrix Synhergy user conference in Berlin for its innovative XWARP satellite cloud computing solution. Net Insight and ATCi partner to enhance quality transportation of services via satellite and fibre-linked components across America. UK space sector profits strong, with key role played by satellite broadband. Scheduled Noivember 14 launch of SkyTerra 1 satellite major step for LightSquared in building next generation nationwide satellite/terrestrial wireless network. NASA selects 13 companies for potential awards in developing next-generation heavy-lift launch vehicle. TCS wins indefinite-delivery-indefinite-quantity contract worth up to $325M to replace U.S. Military Sealift Command’s commercial satellite communications systems. Ultra Communications partners with Polatis on U.S. Air Force program to develop space-qualified optical switching. Military budget cut threats posed by election results receive mixed reactions from satellite industry. Hughes Communications gets a number 1 ranking based on revenue growth in part due to satellite broadband success – mirroring VSAT successes of the 1980’s. Lockheed Martin’s BSat-3b broadcasting satellite, built for Broadcasting Satellite System (B-Sat) of Japan, is launched by Arianespace on an Ariane 5-ECA. Harris Corporation agrees to acquire Schlumberger Global Connectivity Services. Ka-band terminal technology has fallen behind the capability of the available Wideband Global Satcom (WGS) space segment – Rebecca Cowen-Hirsch, President of Global Government Services at Inmarsat..
Hughes Network Systems planning launch of Juptier satellite in 2012, with over 100 gigabits per second of capacity for broadband with downlink speeds as high at 20 Mbps. Harris Corp. wins $64 million third-year option for its Network and Space Operations and Maintenance (NSOM) program contract with the U.S. Air Force. Eutelsat Communications has signed a ten-year agreement with Egyptian satellite company Nilesat for five transponders at the 7 degrees West orbital position. Thuraya to launch post-paid mobile satellite services in Libya. Astrium launches range of innovative satcom products designed to optimize network efficiency, maximize bandwidth, and increase mobility for their end-users. Cracked foam insulation on the shuttle Discovery’s external tank was cut away overnight, revealing serpentine cracks in an underlying structural rib, or stringer. 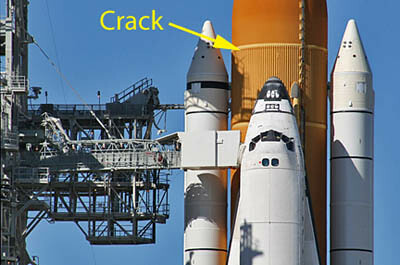 Based on experience repairing similar cracks on other tanks, sources said, engineers believe the damage can be fixed at the pad before the next launch window opens at the end of the month. Follow the news — and live launch — on Spaceflight Now. The Eutelsat W3B satellite declared a total loss less than 24 hours after its Oct. 28 launch because of a leak in its propulsion system will spend the next 20 to 30 years in its parking orbit following ground teams’ inability to guide it into a controlled atmospheric re-entry, satellite manufacturer Thales Alenia Space said Nov. 5. The company said that it has rendered the satellite inert to the extent possible — emptying its helium pressurization tank and whatever fuel remains in liquid state and can be discharged, as well as draining its batteries — to minimize the likelihood that W3B explodes on contact with any orbital debris it may encounter in its elliptical orbit. Too bad they couldn’t ram it into Galaxy 15, the world’s favorite zombie satellite. But seriously, this is a real bummer for all the people who worked on this mission for years at Eutelsat, Ariane and Thales. I remember Astra 1K and it was depressing. Reminds us that this rocket science business is very complex and carries high risks across the board. Loral Space and Communications may divest Space Systems/Loral satellite-manufacturing subsidiary if partially-owned Telesat pursues stock offering. Azerbaijan signs deal with Arianespace to launch its first national satellite. ITU deploys thirty broadband satellite terminals to Haiti as the country prepares for hurricane Tomas. Comtech Telecommunications Corp. Wins $1.0 Million in Orders for On-Demand Emergency Restoral Networks. All systems go for launch from Vandenberg of the Delta II COSMO-SkyMed 4 (Constellation of four SAR radar satellites for global Earth Observation for the Italian Space Agency, the Minister of Defence and the Ministry of Research. Another gas leak causes another delay of space shuttle Discovery’s final launch. WiMax and Ka-band video are hottest topics at Offshore Communications 2010 show. SES WORLD SKIES announces renewal by Clear Channel of capacity deals for 144 MHz on four satellites to deliver connectivity and content to subscribers and audiences nationwide. Azerbaijani Communication Ministry defines company to launch first national satellite. XTAR, LLC, first U.S. commercial provider of X-band satellite services, is awarded a bandwidth contract from Intelsat General Corporation to support military manpacks before field deployment. All systems nominal on BSAT-3b broadcasting satellite launched Oct. 28, designed and built by Lockheed Martin for Broadcasting Satellite System Corporation (B-SAT) of Japan. Hughes Network Systems successfully demonstrates 16 Mbps of TCP throughput and over 20 Mbps of UDP streaming throughput to a single HN9400 Ka-/Ku-band broadband satellite terminal. Orbit Communication Systems receives $6.25 million order to provide multiple telemetry and communications systems to an unnamed customer. ORBCOMM Inc.commissions South African Gateway Earth Station (GES) into operation. NASA’s FASTSAT to be launched with three other satellites aboard the Air Force Space Test Program’s STP-S26 mission from Kodiak Island Alaska November 19. 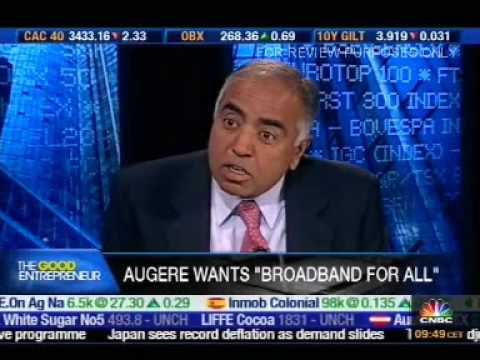 Hughes Communications reports continued success of its U.S. consumer broadband business; projects 67% increase in subscribers by 2015. South Africa requires all ships (including yachts) in its waters to carry an Emergency Position Indicating Radio Beacon that relays location information by satellite when ship is in distress. SES World Skies Selects ScheduAll Booking Management Solution for Worldwide booking of occasional services on its more than 25 satellites. Intelsat S.A. and NewWave Broadband Ltd. sign a multi-transponder, multi-year contract for Ku-band capacity on two future Intelsat satellites, Intelsat 19 and Intelsat 22. Comtech EF Data acquires FX-series WAN optimization, application and platforms developer Stampede Technologies. In wake of the loss of its new W3B satellite shortly after launch, Eutelsat is cheered by rise in revenue. Worldwide interference geolocation services contract awarded to Integral Systems by U.S. Strategic Command. Astrium celebrates 20 years of Eurostar satellite production and accumulation of 370 years of in-orbit operation by 45 satellites that have been launched. MTN Satellite Communications (MTN) equips Burger Boat with communication suite including onboard medical treatment facility with 24/7 video conferencing capability. RigNet Wins VSAT Contract from SandRidge Energy for fully-managed remote communications to more than 20 land-drilling rigs in U.S.
Vizada releases Universal Card solution for prepaid calling on Inmarsat’s IsatPhone Pro. 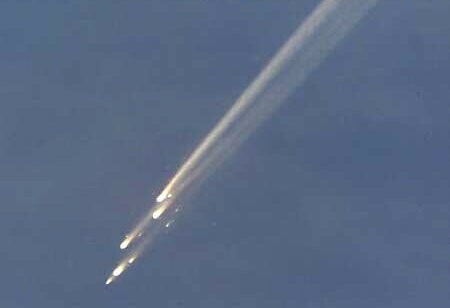 Russian military communications satellite launched on a Soyuz rocket from the Plesetsk Cosmodrome in northern Russia. Delta II’s final scheduled commercial launch is struggling to get off the ground, after scrubbing for the third time in a row on Tuesday night. ITU installs 100 satellite terminals to get links to flood-ravaged regions of Pakistan. Globecomm Systems receives contract from a major media & entertainment company valued at $3.8 million. ViaSat demonstrates full mesh HD video between mobile satellite terminals on Optus C1 satellite using Ausatralian-designed antenna. Viasat completes operational testing of airborne intelligence, surveillance, and reconnaissance (ISR) satcom system with 4Mbps return link from plane. Xinhua reports that China has launched a new metorological satellite, Fengyun-3, from the Taiyuan Satellite Launch Center in northern China. Hughes Network Systems’ HX wideband global SATCOM solution undergoes certification by U.S. Strategic Command SATCOM Systems Expert. Amid criticism, Egypt orders reissuing of TV satellite uplink licenses ahead of November vote. The government and military market remains sustainable and continues to exhibit growth despite changes in policy from the United States and allied governments, particularly in Iraq. Satellite VoIP: Works For Me! Why would anybody promote VoIP over satellite? Sure, low-earth orbit systems such as Iridium and Globalstar are OK, if you’ve got nothing else available (remember, they both went bust a while back). Geosynchronous satellites are a different story. It’s the physics, stupid! I know people who use satellite Internet and they knew before they bought that Skype conversations will resemble a walkie-talkie style: "How are you? Over!" To which the other party would respond, "Fine, thank you. And you? Over!" At the speed of light, the best-case scenario is a half-second round trip to geo orbit. With processing, muxing and gateways, figure something closer to a full second (that’s "one-Mississippi," Bubba). Hey, if it’s free and you have no other Internet options, go for it. But if you’ve got a geo spacecraft whose top priority is mobile satcom for voice services, you might want to give it up. Although we’ve advocated TerreStar’s prospects in the past, they filed for bankruptcy protection recently. In the satcom business, spectrum is king. You can’t do anything without that: no build, no launch, no services. What if you thought it over and decided you’d be better off offering one-way video services to "app phones" such as the iPhone, Android, Palm, BlackBerry, WP7 or WTF Nokia up to. People would pay extra just to have their videos stream without pausing or buffering. Well, at least some would. Add the option of doing two-way for data and you’ve got people out in the boonies ready to pay up. I know I would. A battle between EchoStar, Harbinger Capital Partners and holders of TerreStar Corporation’s common stock could be brewing over the value of the TerreStar’s spectrum and whether all of the company’s affiliates should be in bankruptcy at all, according to several people familiar with the case. Attorneys for the holders of the series B convertible preferred stock filed a motion to dismiss the bankruptcy case against seven of the affiliates of TerreStar Networks, which filed for chapter 11 bankruptcy protection last month. If the motion is granted it could force a change in the restructuring support agreement Terrestar Networks has with EchoStar, which has an investment of $464 million of the comany’s debt. Under the plan put forward by Echostar, which also owns a stake in TerreStar Corp., TerreStar Networks would get $75 million in financing. The company’s $944 million of senior debt would become 97% of the equity of a new Terrestar Networks. The rest of the equity would be shared between the exchangeable notes, which adds up to $179 million, and the other unsecured creditors. TerreStar Networks, a subsidiary of TerreStar Corp., had planned to operate a combined satellite-terrestrial communications network. But the company eventually found itself unable to operate under a $1.2 billion debt load. The company has a complex structure involving a dozen affiliates and various cross-holdings. That has created a situation where a bankruptcy is no longer as straightforward as it might otherwise be. The licenses to the radio spectrum, for example, are owned by two different entities: TerreStar Corporation owns the 1.4 GHz spectrum while TerreStar Networks owns the 2GHz spectrum license. In the motion to dismiss the holders of the convertible preferred stock say that the "above the line" entities — those 100% owned by the parent company, TerreStar Corp. — should not be included in the bankruptcy proceedings, as those entities weren’t in any financial trouble. But removing them from the chapter 11 proceedings would also remove the 1.4 GHz spectrum, which is one of the assets listed in the current restructuring agreement. TerreStar Networks, by contrast, is 89.3% owned by TerreStar Corp., and is the company that filed for chapter 11. It is TerreStar Networks that issued $1.2 billion in debt, which eventually proved too heavy a load. The EchoStar plan could also be blocked by Harbinger Capital Partners, which bought millions in 6.5% exchangeable notes this week. Meanwhile, one of the holders of TerreStar Corp.’s common stock, Marathon Asset Management, plans to weigh in on the restructuring. Marathon has not filed a brief with respect to the plan, however. Looks like AT&T might lose this phone, too. I say make the TerreStar mobile chipset available and subsidize the cost with premium video services. Just because Qualcomm decided that Flo is no mo’ doesn’t mean we should all surrender to broadband bull from the terrestrial carriers. On Reunion Island, it is known simply as "The Volcano." To others, it is known as the Piton de la Fournaise, which is French for the Peak of the Furnace. It is one of the most active volcanoes in the world. The Volcano started a new eruption last month by spewing hot lava bombs as high as 10 meters into the air from several vents. 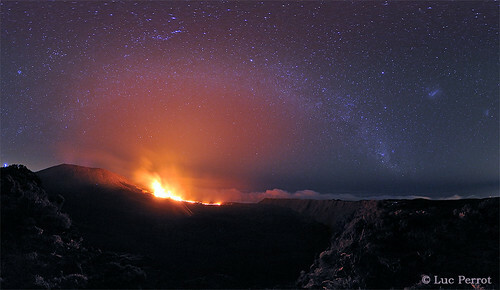 Pictured above, the recent eruption was caught before a star filled southern sky, appearing somehow contained beneath the arching band of our Milky Way Galaxy. Also visible in the background sky is the Pleiades open star cluster, the constellation of Orion, the brightest star Sirius, and the neighboring Large and Small Magellanic Cloud galaxies. (Can you find them?) The Piton de la Fournaise erupted for months in 2006, and for days in 2007, 2008, and in January of 2010. Nobody knows how long the current eruption will last, or when The Volcano will erupt next.